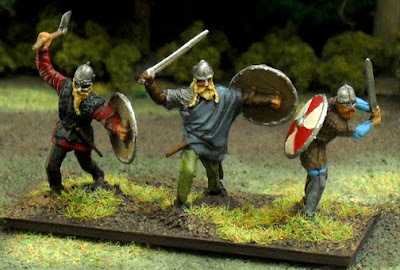 Here is a blade element for my 1/72 DBA Viking Army. These three models come from the Emhar/Imex set. They are a bit larger than Zvezda's vikings. For that reason I mounted the Emhar and Zvezda models on separate bases. I do have one element that mixes the two. 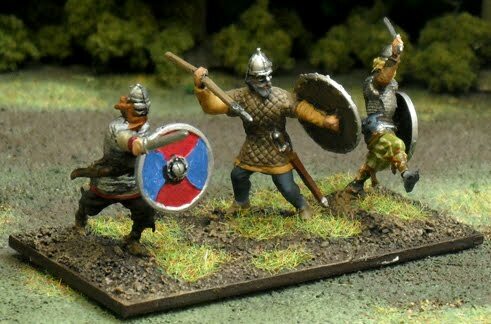 The middle Emahr viking is crouching slightly, which make him almost the height of the two Zvezda gents on either side. Hi, great paintjob on these fine figures and the bases are fine too. I whish I could find some time to paint my vikings but there are a lot of other projects first. Thanks guys. 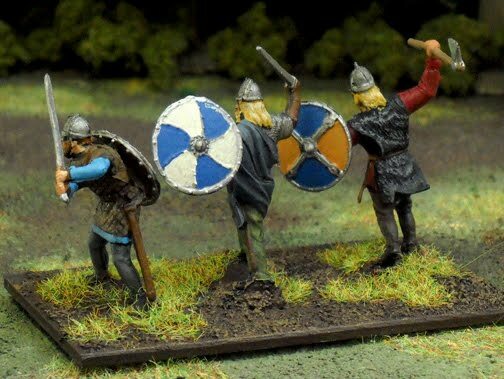 I based these vikings almost a year ago, so it's good to finally start painting them. I really want to get better lighting for my photos. Getting close up to 1/72 models is a bit harder than 28mm.